Build a Course & Event Bookings Website with WordPress – our new online course – is now available on Udemy. It teaches you how to design a WooCommerce Event Booking website by combining the best WordPress course booking plugins, without needing any technical expertise. At the end of this article, I will share a coupon code to give you 50% discount for the course. Over the years, I have worked with many clients to build a WordPress event booking website. 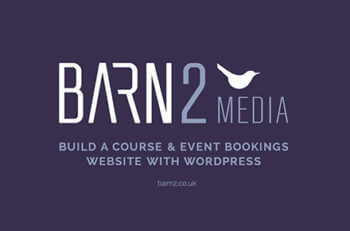 Most of our clients sell training courses but we have designed websites that let people register for all sorts of event. Our blog post about how to use WooCommerce to create a course or event booking website is one of the most popular on our website. This has given us lots of experience of the different ways to develop a course and events website. We’ve tried and tested most of the WordPress course booking plugins, as well as customise existing plugins and build bespoke systems to meet more unique requirements. This has allowed us to develop a unique formula for the best way to build an events site. It’s based on The Events Calendar, a free WordPress plugin by Modern Tribe. Used alone, The Events Calendar lets you display your courses and events on a WordPress website. However it comes with a range of add-ons which can be mixed and matched to create different types of events site. You can display events as a simple list or on a calendar. At the other end of the scale, you can integrate with the world’s leading e-commerce plugin to create a complete WooCommerce event booking website. Used correctly, these plugins are a fantastic way to build a course or events booking website without having to write any code. However you need to understand how the plugins work and the best way to use them. I’ve written this online course to help people to use our formula to design their own events website. To celebrate the launch of our new online course, I’m giving our readers a coupon code to sign up for just $18 (usual price $35). You can sign up for the course and get the discount via this link: https://www.udemy.com/course-event-bookings-website-wordpress/?couponCode=HALFPRICE. The first few lectures are available for free so you can “try before you buy”. I look forward to seeing you on the course and would love to hear your feedback!